Current Position: Home>>Resources>>Topics	>>Do You Really Know About Peptides? Peptides are the organic molecule made up 2 to 40 amino acids, structurally same as protein but smaller. The bonds present in peptides are termed as a peptide bond (1). The bonds are formed between amino group (-NH2) of one amino acids and the carboxylic group (-COOH) of another amino acids via a covalent bond. Most students confused with the terminology of proteins, peptides and amino acids to consider as same, but they are different in their characteristics. For the sake of brevity, prefixes are used to explain the peptides nature. E.g. 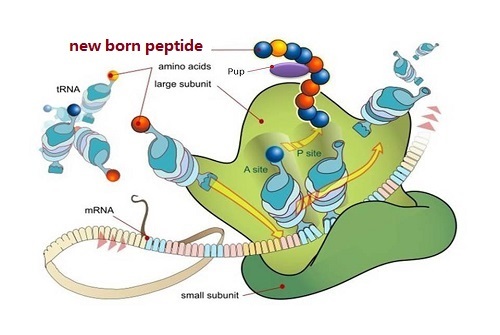 with the combination of two amino acids the peptides are termed as dipeptides, while the combination of three amino acids is called tri-peptides etc. When peptides made up 2 to 20 then termed oligo (Latin means few) and more than 100 are termed as polypeptides (Poly means many)(1). 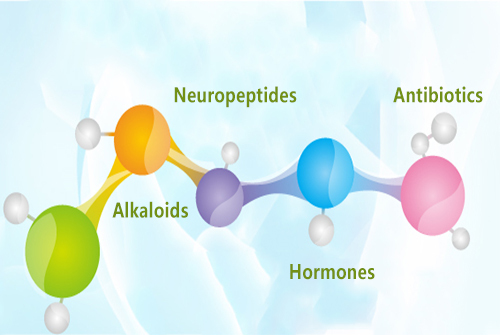 On the basis of production, peptides have the following classes. 1) Ribosomal peptides. 2) Non-ribosomal peptides. 3) Milk peptides. 1.1 Ribosomal peptides: These are those peptides which are formed by translation of messenger RNA (mRNA). Ribosomal peptides are usually used in proteolysis to produce mature form. Ribosomal peptides often have glycosylation, sulfonation, posttranslational modification, hydrosylation and phosphorylation etc. (2 and 3). 1.2 Non-ribosomal peptides: The most important non-ribosomal peptides are glutathione. These glutathiones are the component of antioxidant and play a defense in the aerobic organism. Non-ribosomal peptides are also found in plants and fungi (4). 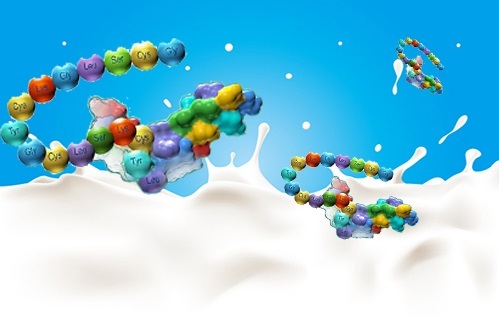 1.3 Milk Peptides: These peptides are generated from the milk protein known as casein. These peptides are also formed from the proteinases by lactobacilli (5). Peptides can be synthesized in the laboratory chemically by a condensation reaction (1). The C-terminus of (Carboxyl group) of the one amino acid, while the N-terminus of the amino group of another amino acid coupled with one another. Chemical synthesis usually starts at the C-terminus end and proceed towards the N-terminus (6). 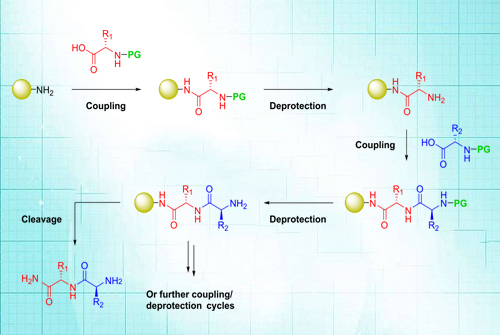 During synthesis, there is a possibility of getting unwanted reactions; because of this protecting groups are used. Unlike biosynthesis of peptides, which stars at the N-terminus, chemical synthesis starts at the c-terminal and stops at the N-terminus. The most important method of synthesis is called as solid phase synthesis (7). Fig: The above figure shows the solid-phase synthesis of a dipeptide using an (amine-functionalized) amide resin. The N-terminal protecting group (PG) can be Fmoc or Boc, depending on the protecting group scheme used (see below). 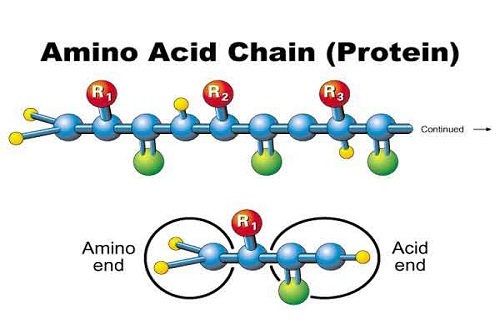 The amino acid side chains (R1, R2 etc.) are orthogonally protected. There are many functions of peptides. Some of the important functions on the basis of particular amino acids are given below. 3.1 Alkaloids: Alkaloids are present in plants, fungi and small plants. They act as a defense mechanism in these organisms. 3.2 Antibiotics: These type of peptides help to prevent the growth of microorganism inside our bodies and usually used as a medicine (8). 3.3 Hormones: These types of peptides have a role to carry out signals from cell to cell. These are present in intestines, liver and kidneys (8). 3.4 Neuropeptides: These peptides are present in various location of the neural tissue. Neuropeptides have the function to regulate and to carry signal to the brain. E.g. endorphins. 1. Khan, Shahid Ullah, Wahab, Abdul, Handbook of Pharmaceutical Biochemistry for Health professionals: ISBN: 978-3-659-68098-4. LAMBERT Academic Publishing (LAP) Germany Jan 2015. 2. Pons, Miquel, Miguel Feliz, M. Antònia Molins, and Ernest Giralt. "Conformational analysis of bacitracin A, a naturally occurring lariat." Biopolymers 31, no. 6 (1991): 605-612. 3. Torres, Allan M., Ian Menz, Paul F. Alewood, Paramjit Bansal, Jelle Lahnstein, Clifford H. Gallagher, and Philip W. Kuchel. "D‐Amino acid residue in the C‐type natriuretic peptide from the venom of the mammal, Ornithorhynchus anatinus, the Australian platypus." FEBS letters 524, no. 1-3 (2002): 172-176. 4. Hahn, Martin, and Torsten Stachelhaus. "Selective interaction between nonribosomal peptide synthetases is facilitated by short communication-mediating domains." Proceedings of the National Academy of Sciences of the United States of America101, no. 44 (2004): 15585-15590. 6. Isidro-Llobet, Albert, Mercedes Alvarez, and Fernando Albericio. "Amino acid-protecting groups." Chemical reviews109, no. 6 (2009): 2455-2504. 7. Mitchell, Alexander R. "Bruce Merrifield and solid‐phase peptide synthesis: A historical assessment." Peptide Science90, no. 3 (2008): 175-184. 8. Duquesne, Sophie, Delphine Destoumieux-Garzón, Jean Peduzzi, and Sylvie Rebuffat. 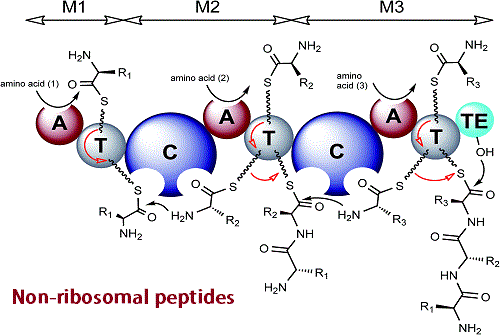 "Microcins, gene-encoded antibacterial peptides from enterobacteria." Natural product reports 24, no. 4 (2007): 708-734.